This month at the David Zwirner gallery, video artist Diana Thater takes us on an visual voyage. Her new exhibit entitled "Science, Fiction," is inspired in part, by our global ecological state of affairs. 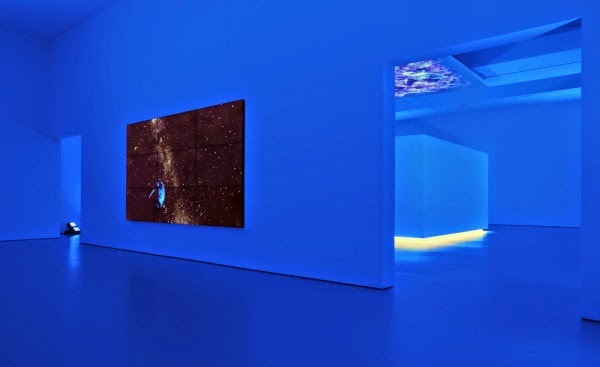 Your voyage begins as you step into a gallery that is bathed in a deep blue light. As your eyes adjust to the unnatural light, you find yourself gazing at rectangular panels, where videos of outer space are projected. A closer look reveals a galaxy of slow moving stars, populated by a strange looking space craft floating across it's expanse. The videos are entitled "The Starry Messenger". An impression of zero gravity may take hold of your senses as you let your eyes float with the stars. That feeling of floating is confirmed when you are confronted with a very large cube in the next room. It is hovering a short distance above the floor and emits a bright yellow glow at it's base. A video of dung beetles burrowing into grass is projected on screen above the cube. Is there sunlight contained in the box? Is the eco-activity fueled by it's glow? The gallery supplies a science news release that may bring insight your recent close encounters. This exhibit is perfect for curious children and adults alike. The exhibit is up until February 21st.